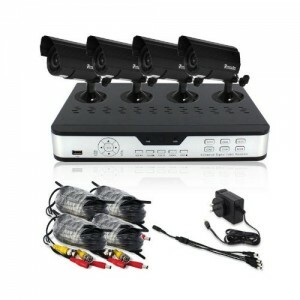 Zmodo make a very cheap 4 security camera system with the PKD-DK4216 system. It is easy to install and makes uses of 4 x 6mm bullet cameras. They operate with the 600TVL format. There is a stand alone DVR with this package. This offers 600 tv lines of resolution. These cameras are not designed to offer pristine crystal clear night time video footage, for that you will have to pay a lot higher and opt for a HD system. They can capture infra red footage at night at a distance of up to 30ft. The night time images are displayed in black and white. TIP – You’ll get better quality images during playback/recording if you forgo the included dual cables and opt for coaxial cables. The Zviewer app allows you to remotely monitor your security camera system from your computer, smartphone or laptop. You can check how much space is left on your hard drive or see if any motion has triggered the cameras to record (if you have them set to motion activated recording). You can also download footage from the DVR onto a USB flash memory pen. All footage on the system is classified into categories so it’s quick and easy to navigate to the files you want and drag and drop them onto your USB pen. You will receive 60ft of cables for connecting the cameras to the DVR (digital video recorder), plus you can view the footage from each camera on it’s own or in split screen mode, accommodating all cameras if you wish. Hard drive space is automatically reduced as the footage is compressed with the industry standard h.264 standard. But you can further reduce the amount of space used on the hard drive by choosing to record with motion detection. You can also select continuous or time scheduled recording modes. The DVR allows you to watch the footage on a computer screen or professional monitor, and even on your smartphone + across 3G networks. There is both VGA and BNC output connectors on the device. A no frills cheap system, easy to set up. Encased in tough weather proof metal. Handy features like date/time recording + motion detection. Image quality during daylight is not HD but it is fine for most residential properties and small businesses to be able to get a good scope of the surroundings. But don’t expect pristine night time footage, unless you have floodlights or illuminators. All in all this is Ideal for home, small business use.